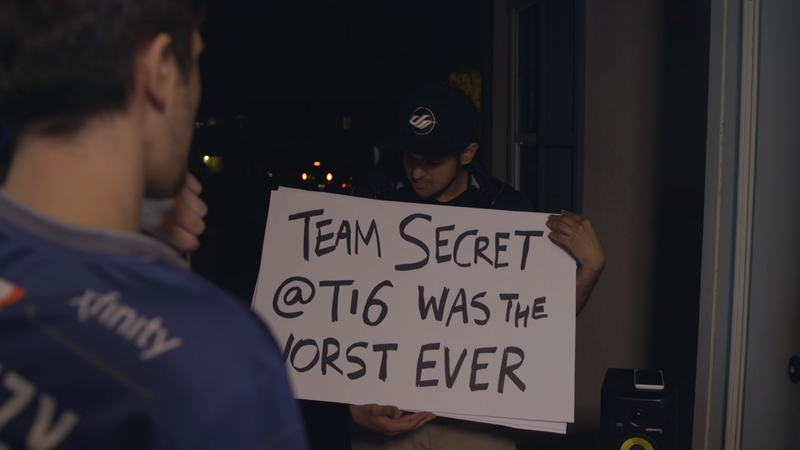 This weekend’s The Summit tournament is the eighth iteration of a Real World-meets-esports event, and it’s been delivering on the comedy front. One video, a play on the Christmas rom-com Love Actually, has Sam “BuLba” Sosale dropping some cards for former teammate Artour “Arteezy” Babaev. The gags center on Sosale’s tendency to hop teams frequently (he’s moved teams four times since the start of 2016), as well as the pair’s run on Team Secret in 2016. Going into The International 2016, Team Secret was looking like an all-star squad, with some of the best talent in Dota 2 on the team—until they flamed out at 13th-16th, leading to a splintering of the group and one severely long blog post about all the drama inside the team. “Let’s never do that again, okay?” reads Sosale’s final sign. If you’ve ever thought that a tournament mixing esports pros with reality TV and pre-recorded comedy bits was a good idea, The Summit has been perfecting that angle for some time now. Here’s another sketch, involving Dota pro Jacky “EternaLEnVy” Mao as the voice of Amazon’s Alexa. And even between matches, with the pros on the couch to sometimes commentate the games other teams are playing, there are still some gags. If you want to follow the rest of this weekend’s solid Dota matches and meme videos, you can check out the stream at Beyond The Summit’s Twitch channel.